If you can read, you can cook. I should preface this post with a disclaimer: I do not know the first thing about football. I just had to Google, “when is Super Bowl 2013?” But at least I knew enough to know that it would be sometime soon, right (thank you Facebook friend football fans for your sports updates in my News Feed)? Chad does not follow sports… I mean not really. I’ve never seen him be interested in professional football or baseball or basketball; but UFC is another story entirely. He does love UFC. And taking apart/putting together his rail buggy. Oh and we are sort of crazy at Evan’s recreational soccer league. Not bad crazy. Just nail-biting/leaping from our seats/pacing back and forth crazy. I learned that from my mom, I think (Hi Mom!!). Anyway, neither one of us follow sports traditionally… but the snacks? I can get down with the snacks. Starting with these baked chicken wings. My first few cracks at baking chicken wings happened on Chad’s last birthday. I’m pretty sure he could eat his weight in chicken wings. If you’ve been reading here for a little while, you might remember THIS Hot Habanero Sauce that we put on everything; you know we like a little heat. Chipotle peppers in Adobo Sauce are… well they are kinda spicy. They will heat up a pot of veggie chili in a hurry. 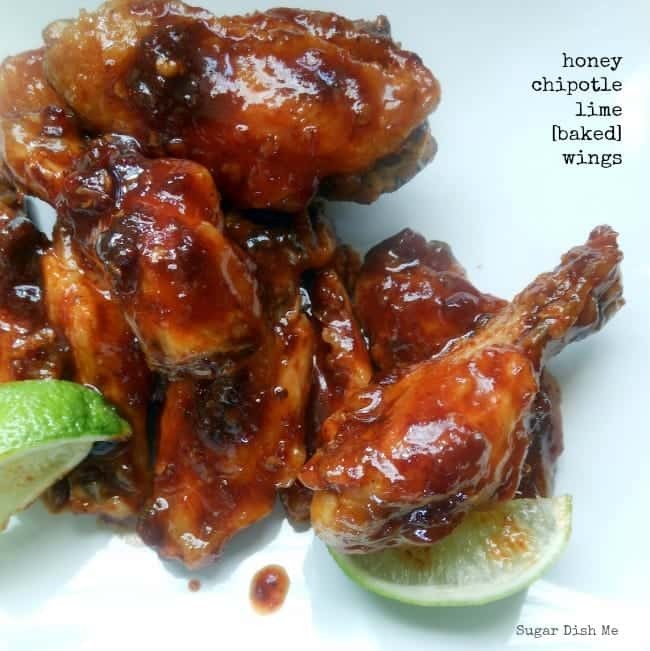 So I put them in the blender with a little honey and lime and tossed them with this batch of baked chicken wings. Ohhhhh mah gah these wings are … delicious like crazy. 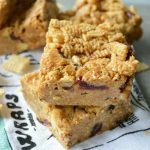 Sticky and spicy and sweet with just the right amount of crunch. I think I could definitely (maybe?) pay attention to a football game with a plate of these. The funny thing about my total lack of attention span when it comes to professional sporty sorts of things is that my family is a whooooole other story. My brothers? Football junkies. My tiny little mommy? She will leap off the sofa in defiant exclamation in a heartbeat. I think my sisters may be in the I-have-no-idea-what’s-going-on club with me, but one of them goes to an awful lot of professional and college games. Maybe it’s just that she likes tailgating and looks adorable in a jersey. None of that matters though, really. Because if you are watching football? 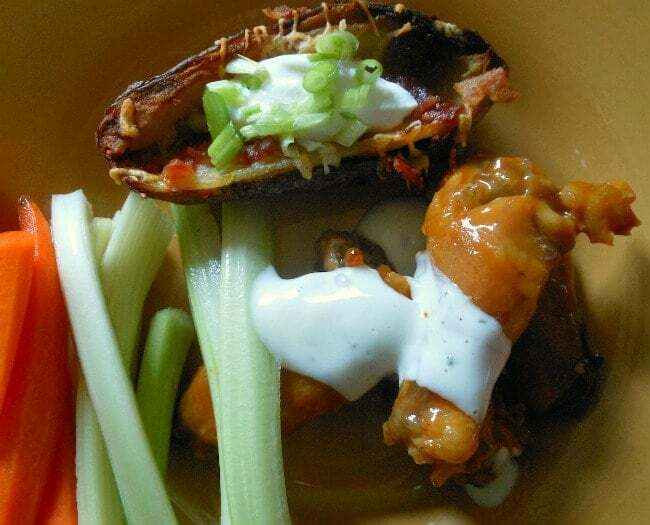 You should make these wings. And if you are not watching football? You should make these wings. Using a very sharp knife, separate the wingettes from the drummettes at the joint. Trim the tips off the wings. In a large stock pot or dutch oven bring about an inch of water to a boil. Place the wings in a steamer basket, put the basket over the boiling water, and cover. Steam the wings for 10 minutes. Remove the wings from the basket, pat them dry with paper towels. 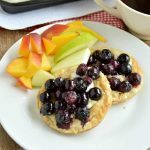 Lay them out in a single layer on a plate or another baking sheet, cover with paper towels, and refrigerate for an hour. Pre-heat the oven to 425 and spray a baking sheet with non-stick cooking spray. Discard the paper towels and place the refrigerated wings in a single layer on the prepared baking sheet. Bake for 20 minutes, flip them over, and bake for 20 minutes on the other side. 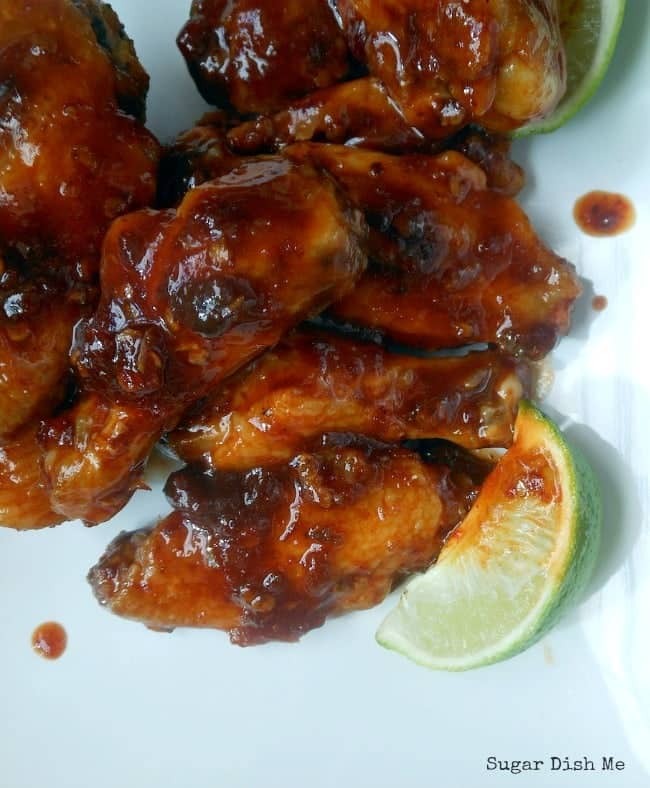 While the wings bake, make the sauce by putting the honey, chipotle peppers, adobo sauce, soy sauce, and lime juice in the blender. Blend until smooth. 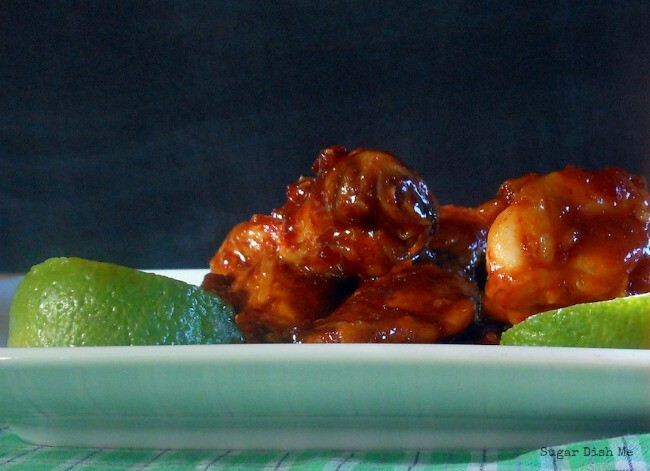 Toss the baked wings with the sauce and serve hot or cold- these are great either way. 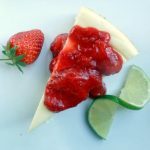 Cooking method from Alton Brown. Sauce inspired by THIS recipe at I Am Simply Tia. Just toss chicken tenders in panko bread crumbs, bake, turn once so both sides crisp, and THEN use this sauce. 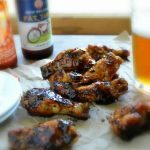 The sauce is straight up awesome, though I am kind of partial to a tall cold beer and chicken wings. I’m not a wing fan, but I could see this yummy sauce on drumsticks. Yes, the Super Bowl is February 3rd. Go Ravens 🙂 And go honey lime drumsticks! Yes! Drumsticks would be great! Or baked breaded chicken fingers. Or everything with this sauce. I have a horror story about chipotle adobo chilies… I had a recipe in my head for some crockpot shredded chicken and the recipe I had read called for those chipotle adobo chilies – well, I didn’t remember if it was the entire can or just one…nothing on the can helped and I was too lazy to look it up online…so I just dumped the entire can in my crockpot and went to sleep… The next day, my eyes were burning by the time I reached the living room…and the kitchen air was almost unbearable. I even braved a small taste of the chicken…I about burned a hole in my tongue. AHHHH… EPIC FAIL. And I don’t watch football either…I pretty much loathe it. Holy— that is hilarious. I’m not sure if you were following along here when my pepper plants were producing ridiculous amounts and I started playing around with homemade BBQ sauces and things? Anyway, I started cranking out this Hot Habanero Sauce, and the first round I made on the stove-top and the boys and I had to run from the house gasping for air. Norma Jean hid in the closet for the rest of the day. Needless to say subsequent batches are made on the grill burner OUTSIDE. This sauce here isn’t hot, though. Just a tad bit of spice (unless you get crazy with the chipotles) and that awesome smokiness. I don’t think there’s a vegetarian equivalent for chicken wings… I’m sorry. What about some breaded mushrooms dipped in the sauce? These wings look sooooo fantastic Heather!!!! Well done. Hi, Tia! It’s good to hear from you! these look Out of this WORLD gooood!! Actually drooling. These look amazing! and I bet they work just as well with a couple of episodes of Modern Family as they would with football…or really no episdoes of anything and just more of these! Watching Modern Family right now… out of wings. You can’t win ’em all I guess. I love this show!!! Oh yeah, these are going on the Superbowl party list. YUM. 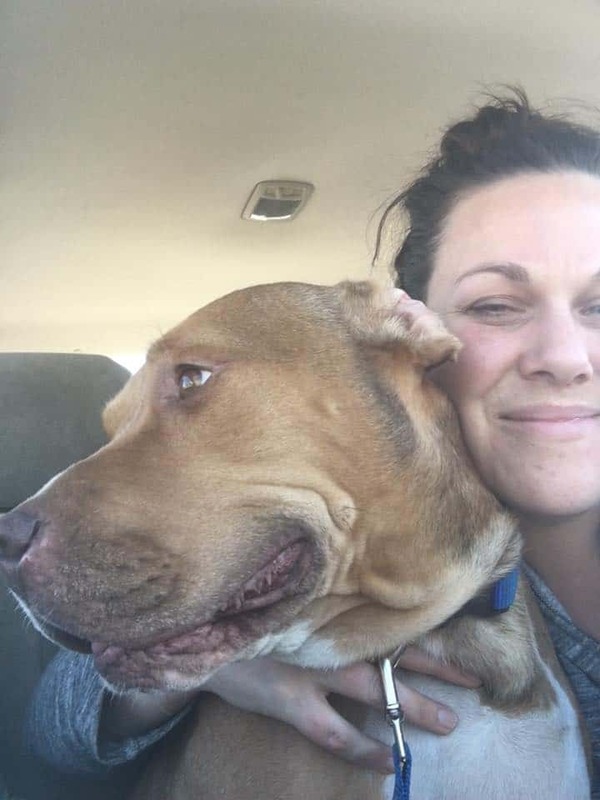 Heather lives in North Carolina with 6 rescue dogs, foster dogs [adopt! ], 2 identical cats, and her very tolerant family. If you wanna cook and like to eat you're in the right place. Fun, easy, fresh food. Loves sprinkles, has too many brownie recipes, and will probably talk too much about her dogs. IF YOU CAN READ, YOU CAN COOK!